Connecting with your partner's child isn't always easy. If you don't have kids of your own, it may be your first time interacting with kids other than your nieces and nephews or distant cousins. It can get awkward. What do you say? What do you do? You want to be friendly, but not seem desperate (kids can smell your fear and will eat you alive). Here's a few ideas on how you can connect with your partner's kids. Are you a big sports fan? Share your love of the game with your partner's child and take them to a home game in your town. Whether you follow baseball or if you're an NBA fan, you can bring along the little sports fan, too. You don't have to catch a professional game. From high school to club teams, there's ample opportunity to share a sports-themed experience. If you partner's child participates in a sport do your best to make it to a few of their games. However, tread lightly. Don't impart your knowledge or criticism on the child. Remember to respect their boundaries and space and let the coaching staff coach. According to data reported by the National Wildlife Federation, the average child today spends only 30 minutes outdoors each day, yet more than seven hours behind a screen. One way to bond with your partner's child is to take a family trip outdoors. Whether you opt to spend a weekend camping or choose to spend a few hours picnicking out by the lake, outdoor time will bring you all together. And it's healthy, too. Kids who spend time playing outdoors are less likely to be obese and they have higher fitness levels than their peers. Additionally, a little time outdoors can help kids develop their critical thinking skills, helping them score higher on tests at school. Spending time with your partner's kids doesn't have to be complex. It can be as easy as spending a night or afternoon in, playing challenging, brain-teasing puzzles. Take a break from the video games and screens and work together to solve a puzzle. Use an online resource like Busy Teacher to make and print out your very own puzzles, including Double Puzzle, a word scramble game. Choose your own words or theme and simply print out your puzzle and start playing. Puzzles are great for children's learning and hold many benefits such as cognitive skills and problem solving in addition to social and self-esteem development, according to the experts from Learning 4 Kids. Does your partner have a teenager who's ready to start driving? 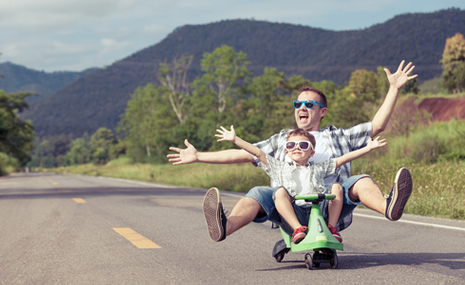 If your partner's kid is ready to learn how to drive, consider teaching them a thing or two about life behind the wheel. Start small and refresh their memory with the basics of car safety. Once they're ready to take the wheel, practice, practice, practice. And once they're earned their permit you can drive along with them to help them earn their driving hours to help them eventually get their license. This is a fun yet educational way to interact with your partner's child. However, before you decide to teach your partner's teen a thing or two about driving, consult with your partner first and make sure you agree on common terms first. Spending time with the family in the kitchen provides everyone the chance to catch up and talk about what's happening in their lives. Cooking doesn't have to be complicated. Whether you're an experienced chef or a clueless cook, you can benefit from cooking with the entire family. Follow along with a basic recipe and let your partner's child take the lead. Allrecipes.com offers dozens of kid-friendly recipes that are accessible directly from their website, from mac and cheese to chicken fingers. 1 responses to "Tips for Connecting With Your Partner's Kids"